One day during his visit to London, King Jai Singh was walking in casual dress in Bond Street. He saw a Rolls Royce showroom and went inside to inquire about the Price and Features etc of their cars. Considering him a just another Poor Indian citizen, showroom salesmen insulted him and almost showed him the way out of the showroom. After this insult, King Jai Singh came back to his Hotel room and asked his servants to call the showroom that King of #Alwar_city is interested in purchasing their few Cars. After few hours King reached the Rolls Royce showroom again but with his full astonishing royal manner and in his royal costume. Until he reached the showroom there was already red carpet on the floor and all the salesmen were bent with respect. The King purchased all the six cars that they had at showroom at that time and paid full amount with delivery costs. 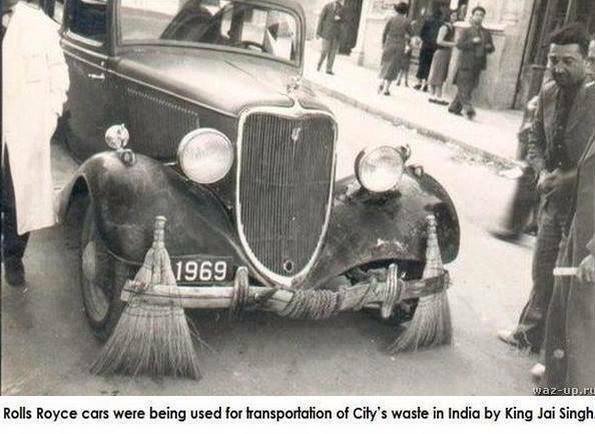 After reaching India, King ordered municipal department to use all those six Rolls Royce cars for cleaning and transporting city’s waste. World’s number one Rolls Royce cars were being used for transportation of City’s waste, the news spread all over the world rapidly and the reputation of Rolls Royce Company was in drains. Due to such reputation damages, sales of Rolls Royce dropped rapidly and revenue of company owners started falling down. Then they sent a Telegram to the king in India for apologies and requested to stop transportation of waste in Rolls Royce cars. Not only this but they also offered Six new cars to king free of cost. When King Jai Singh observed that Rolls Royce has learnt a lesson and they are sorry for their mistakes, king stopped using those cars for carrying wastes. Clubs and housing societies are hosting the `Mata ki Chowki’ at night where vast numbers of people gather to sing the `mata ki bhent’. Of late, a unique Shiva `tandav’ is also being drafted into the Navratri calendar in Andheri’s Lokhandwala Complex. The hilltop temple of Vaishnodevi in Malad will organize a havan from 4 to 7pm followed by the Mata ki Chowki. “We host a full calendar of events during Chaitra Navratra as well as Sharadiya Navratra,” says chairman Kiritbhai Shah. “On the morning of October 3, around 1,100 little girls below the age of 11 will arrive for the ‘kanya puja’ ceremony where they are worshipped like the Goddess.” The temple trust takes its commitment to the girl child beyond lip service by warning people of the dangers of female infanticide all year round.